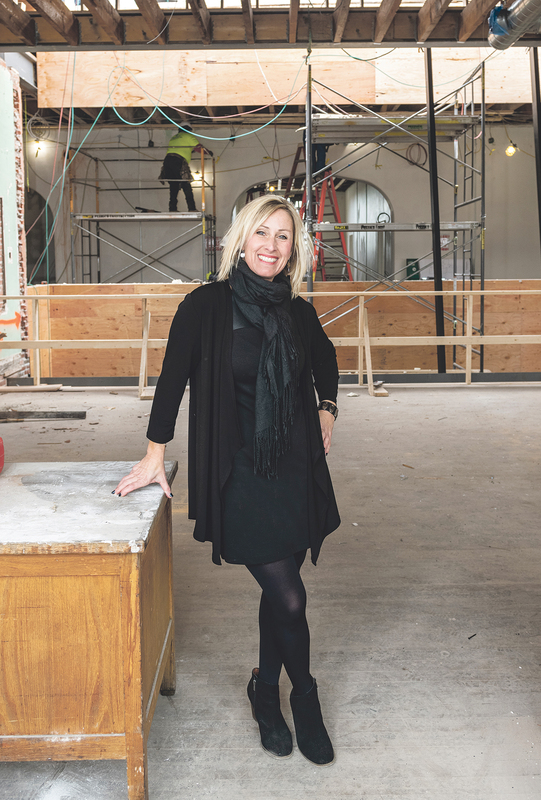 The transforming of a historic school building into a co-working and meeting space in Newport is wrapping up, with a May 1 opening on the books. Renovations to the Class A space, Innovate Newport, is in its final stages, sweeping up the dust, fine-tuning its programming and welcoming tenants. Tuni Schartner is the Innovate Newport director of entrepreneurship and innovation. PBN: We saw Tom Jackman of Pezucco Construction on a video at the Innovate Newport Facebook page saying the renovation is 90% complete. There were some glass wall and elevator issues? All worked out now? SCHARTNER: Yes, and no. The stunning angled glass wall is installed and more beautiful than we could have imagined, but the elevator is still being installed. We are in the process of having the office suite tenants move in throughout the month of April and are still planning on a May 1 full facility opening, at which time all co-working members can start working there and all of the meeting and event spaces can be reserved. PBN: Where is Innovate Newport in terms of tenancy overall? SCHARTNER: We took approximately 10,000 square feet of the total 33,000 square feet – facing west off the main hallway on the first and second floors – and made those our prime office suites. They have been spoken for since November and those are the office-suite tenants that are in the process of moving in. These tenants are: INSPIRE Environmental; the Newport County Chamber of Commerce, which is also a partner in the project with the city of Newport and the Economic Development Foundation of Rhode Island; Towerhill Associates; Drupal Connect; and VizSafe. The rest of the space is all co-working, meeting and event space and we are continuing to sign up co-working members daily. We have a room on the second floor with 16 designated desks and all of those have been spoken for. Our most popular membership, aside from the designated-desk membership, is the part-time membership. Because the designated desks went so quickly, we are considering taking one of the large conference rooms and using it for a new, “hot desk” membership option that would fall in between the full-time and designated-desk memberships. We are planning for upwards of 60 co-working members to be signed up by our May 1 opening. PBN: There has been talk about developing synergy between local marine-tech businesses via Innovate Newport. Is this something that needs much boosting? SCHARTNER: While Newport is a globally recognized hub of activity for marine-technology businesses, much of that activity today is being driven by the large defense contractors. What Innovate Newport will drive is the diversification of the marine-tech industry by facilitating the creation and attraction of marine-technology startups to the city and region. By leveraging our proximity to the [U.S.] Navy, Rhode Island’s world-class marine-technology supply chain and the major defense contractors, we will create a marine-technology ecosystem that will truly be world class. PBN: With construction completed, what is the next main priority for you? SCHARTNER: Opening! Planning exciting events with our partner organizations, such as our first big event with Rhode Island Inno and Cox Business on Thursday, May 9, and our official ribbon cutting, as well as hosted events such as DesignxRI’s May Clambake, RI Bio’s June networking event, Newport Interactive Marketers June and August monthly events, the Northeast Clean Energy Council’s July 18 event and so many more. Also, we are getting our co-workers signed up and helping our office suite tenants settle in. There’s never a dull moment and it’s all great! PBN: Rumor has it that you’ve led some 500-plus tours of the under-construction space. Will you miss the hard hat? SCHARTNER: I am very much looking forward to not wearing a hard hat five days a week! I will continue to give tours ­– I had five this morning before heading up to Commerce RI for a meeting – but I am looking forward to these tours without the hard hat.